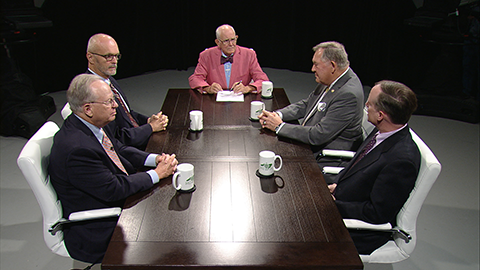 This week's NC SPIN has lots of great discussion including problems in our university system, failures in the Read to Achieve program and we ask the panel to tell us something we don't know. Be sure to catch this one. In your discussion of reading issues by the third grade an important issue was not discussed. Although poverty is certainly an important factor, so is lack of family health care. There are many children of working poor families who, although the child may qualify for Medicaid or CHIP, their parents may make too much money to qualify for financial assistance for health insurance. Having a sick or opioid addicted parent is a major impediment to a child's ability to learn. NC needs to expand Medicaid to correct this. Third grade Reading teacher here! Thank you for the discussion on the Read to Achieve program. I have taught 3rd grade and Read to Achieve for the past 4 years. The team was correct in their comments about family poverty and pre-k being major factors in the results we have seen. I have seen first hand the devastating effects of this on students. However, these problems were already in play before the program was implemented in NC. I am in the process of looking at my current standards scores on RTA (every weekend) and still come to the same conclusion. Read to Achieve has taken over the third grade class and curriculum. The passages are not current, they have major flaws and are NOT interesting to read. I have asked my previous years students for feedback on the program, as well as parents. They have all said their love of reading declined in third grade. This program is overwhelming the class with dull, black and white text. I try to make the instructional passages fun and engaging but teachers cannot take them home to lesson plan because of being state test. ( 3 test every standard and 3 instructional to use) We only have 2 weeks per standard with testing included. This brings me to testing... These are state test. ( 3 every 2 weeks). On top of that there is beginning, middle and end of year testing. Then there is Progress monitoring testing and regular in class testing ( grammar etc.) This is another factor in the third grade scores. Where is the teaching? Where is the teaching of the love of reading? Just some thoughts. Maybe we should dive into the program that is not working instead of looking for answers around it. Thanks again for the topic discussed.